Imagine a delightful place where cathedral-like mountains rise into a blue sky. Below, a stunning town – all church steeples, flower boxes and cute piazzas – nestles, surrounded by fragrant meadows dancing in the breeze. Welcome to Madonna di Campiglio, an utterly charming Italian town in the heart of the Brenta Dolomites mountain range. This town is so gorgeous, it was once a favourite of the Habsburg Empress Sissi and Emperor Franz Josef in the late 19th century. They loved to walk here by the rivers and lakes and into the forests and hills. And the location is just as popular with hikers today. In fact, we’d go as far as to say it’s hiking heaven! 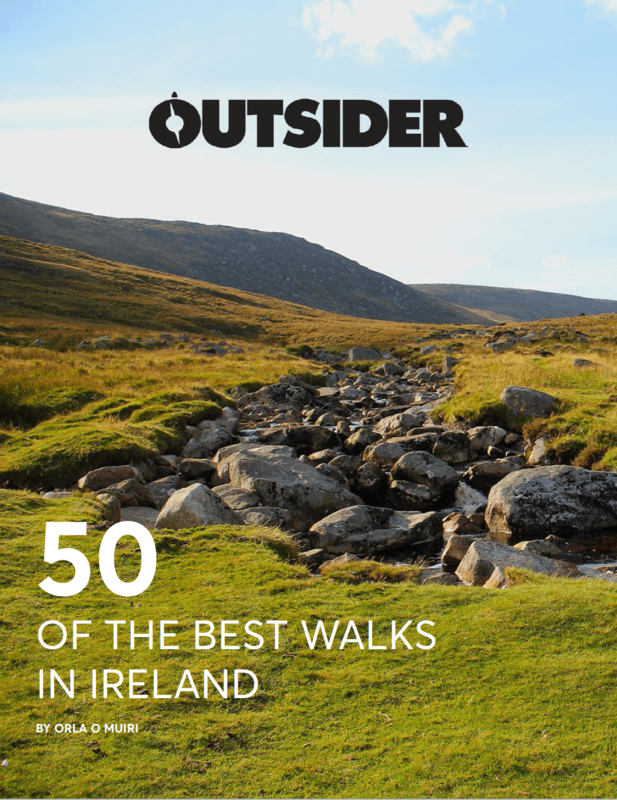 So here are 6 reasons why you should consider joining us for a week from 7 September 2019 on Outsider’s newest hiking trip. Once a huge coral reef in the sea, the Dolomites is now a vast mountain range in northern Italy. The chain boasts 13 3,000m+ peaks, massive rock faces and stone towers teetering impossibly, all sublimely juxtaposed with lush green meadows where the jingle of bells drifts on the breeze as cows and goats graze in the sun amongst the flowers. By day the glorious and craggy peaks stand tall against blue skies and come dusk they glow as pink as the sun sets, before the dark descends and a dome of sparkling stars illuminates the night sky. If you think my gushing sounds over the top, maybe you’ll believe just how stunning this region is when you hear that in 2009 UNESCO declared theses mountains a World Heritage Site due to their beauty and scientific importance. And the best way to explore those incredible mountains are on the endless well-marked and well-maintained trails that wind their way all through the range. On the Outsider trip, you’ll be led by a professional guide on a choice of A and B hikes. So you’ll experience the best of these walks. 2. You’ll be staying in gorgeous Madonna di Campiglio – but without the crowds! The elegant town of Madonna di Campiglio nestles at an altitude of 1550m in the stunning valley between the Brenta Dolomites and the glaciers of Adamello and Presanella. This is one of Italy’s most fashionable ski resorts in winter. A summer visit offers all of the same charm – just without the hordes! It’s one of our top choices for enjoying the post-hike reward of eating a luscious Italian pizza and drinking a zingy Aperol spritz while watching the world go by. And of course, Madonna di Campiglio sits within the Adamello-Brenta Natural Park, which comprises 50,000 hectares of wildness. It also offers 450km of mountain paths meandering through cool fir woods and bewitching larch forests, alongside babbling rivers and twinkling lakes and over mountain passes. 3. Your lodgings are a fancy hotel! Is there anything nicer than spending long hours in the hills, working those lungs and legs, and then coming back to really lovely accommodation? The elegant and luxurious 4-star superior Cristal Palace hotel is just the ticket we reckon. First up, you’ll be able to unwind any tight muscles in the heated indoor pool, or perhaps indulge in a massage treatment at the Cristal Energy SPA. The other way to recharge your batteries, of course, is with a good meal and a relaxing drink in the restaurant and bar which boast panoramic views of the mountains. And when it’s time to rest those weary limbs, you’ll find your room luxurious, comfortable and spacious. The other bonus of staying in a nice hotel, as opposed to our hut-to-hut trip, is that if you do decide to take a day off from hiking to simply relax or wander around the town, there is no issue. This is a holiday after all! For hikers, the best times to travel are autumn (late August till mid-September) or early summer (June and early July) as this is when temperatures are most suitable. If your visit coincides with autumn, as ours does, keep your eyes open for lovely Edelweiss, the flower we’ve all come to associate with The Sound of Music but which is a local favourite. And also watch out for marmots (cute furry mammals a bit like big squirrels). Or maybe we should be saying, keep your ears open. You’d easily miss these gorgeous creatures as they pop in and out of their burrows but they give the game away by whistling loudly to each other to warn of intruders. They are particularly busy in autumn gathering food and fattening up for the long winter ahead. If you travel in June and early July, you can expect blankets of flowers blooming in an array of colours across the meadows. While the carpets of flowers will diminish as you move through July and August, there should still be plenty on show in early September. Other animals to watch out for in the quieter areas are chamois, red deer and roe deer, foxes, hares and birds of prey. 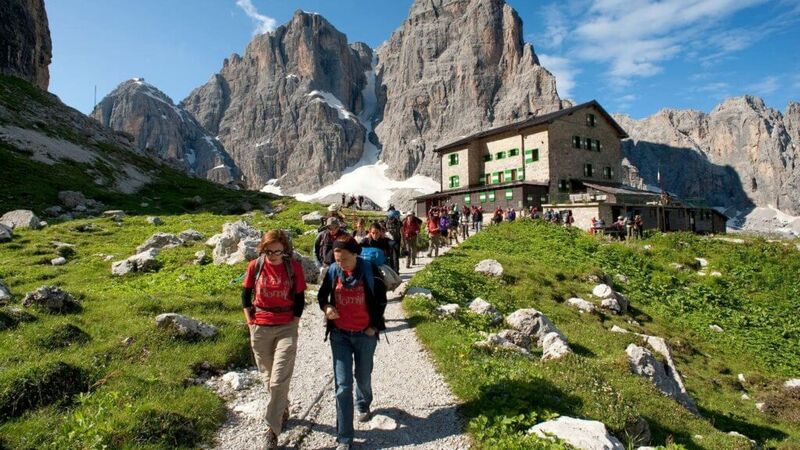 If you translate ‘rifugio’ to refuge, this is perhaps the best way to start explaining the wonderful and motley collection of hundreds of mountain huts that are dotted across the Brenta Dolomite mountains. You’re likely to come across one of these places to eat, drink and recharge every three to five hours as you travel along your chosen route. You’ll find them perched dramatically on the top of remote craggy summits that you’ve spend hours climbing to reach and snuggled cosily in the folds of green summer pastures or ‘Alms’. You can also sleep in the rifugi but we’ve got your accommodation sorted in the Cristal Palace hotel this time, so your overnight rifugio adventure will have to wait for another time! These ‘rifugi’ are so much more than just practical places to refuel, however. Each has its own unique personality, formed from its history, landscape and the personality of the owners and people that work there. Many of the higher ones were built more than a century ago for the mountaineers that first roamed this region (you’ll see incredible black and white photos adorning the walls), while those in the Alms are often converted farmhouses, serving up home-produced cheeses and meats. Whichever you choose, you’ll be treated to a huge array of delicious food, cakes, wines and beers. But what they also seem to have in common is killer views and a welcome so hearty it’s like being greeted by a cosy pub with an open fire on a freezing day. All warm, wooden nooks and crannies, you’ll be incredibly well fed and watered as you sit amongst gangs of other happy hikers. 6. The local food and wine are simply delicious! The food in the Dolomites is exquisite. Taking influence from both Italy and South Tirol, you’ll be treated to a number of local dishes – especially when you eat in the mountain huts. My ‘don’t miss’ favourites are fresh tortellini stuffed with local ham and Tries di Canederli – three delicious balls of farm-style dumplings, and an array of local game meats. Oh and let’s not forget about dessert! Few things in life can beat a good Apfelstrudel and homemade custard which the Italians have mastered and brought to a whole new level. The local wines certainly won’t disappoint either. One of my favourite wines (called Arunda) of all time was consumed on the terrace of a remote mountain hut in the heart of the Dolomites. The hills and valleys of the Dolomites are home to three grapes, so whether your tipple of choice is rosé, white, red or sparkling, you will be treated to an array of good local wines wherever you go. 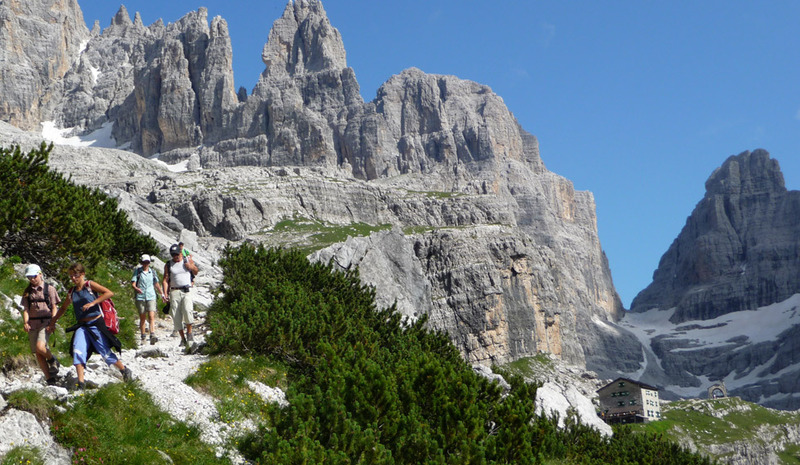 The cost of this week-long hiking trip to Madonna di Campiglio is €949pps but this covers practically everything, including flights, dinner, bed and breakfast, your hiking guide, whatever lift passes are needed, and more. All you’ll really have to pay for are your lunches and drinks. For more information or to book, contact Edina: outsider@topflight.ie; tel. 01-2546327/01-2401753.